When it comes to alcoholic beverages, beer is often touted as the drink of choice to serve with Chinese food. In reality, the Chinese have been avid wine drinkers for centuries. But unlike the more familiar French and Italian grape wine varieties, traditional grain-based Chinese wines haven't completely caught on in the west. Part of the problem, aside from the relative difficulty of finding Chinese wine, is its high alcohol content. For example, there's the notorious Mao Tai: a fiery, 55 proof concoction served to foreign dignitaries at diplomatic banquets. Now that is definitely a wine you sip like liquor, not put back glass by glass. Recently, however, the Chinese have been experimenting with grape and other fruit wines. Lychee wine, plum wine, and a honey grape wine made from white wine and honey are all now on the market. Unfortunately, like rice wine, the selection of Chinese fruit wines in liquor stores and restaurants is not likely to increase anytime soon. But the difficulty in obtaining Chinese spirits doesn't mean you must forego wine with your meal altogether. There are several French, German, and Californian wines that are well surprisingly well-suited to Chinese cuisine. When choosing a wine, consider where the various dishes you are sampling originated. China is a huge country with regional differences in climate and resources, and each region has developed its own culinary style. 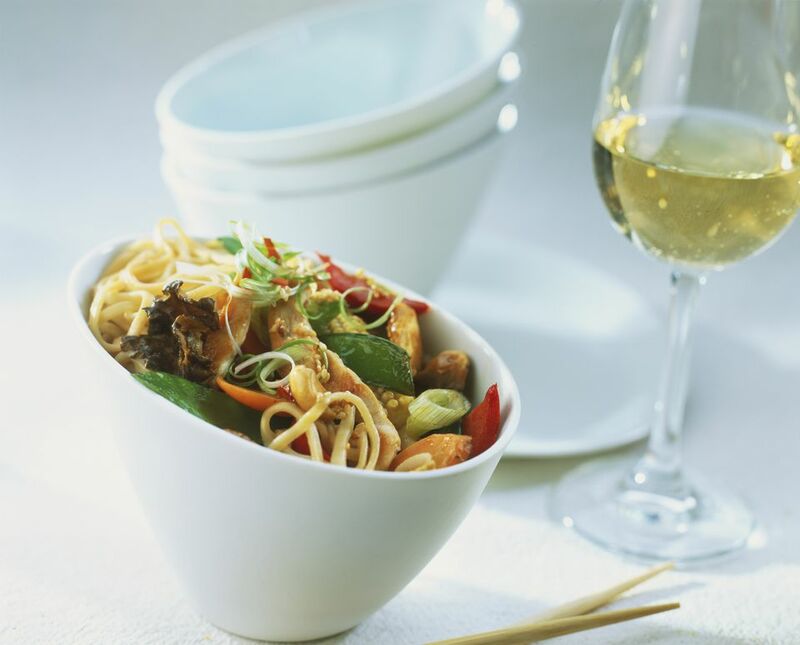 For highly spiced Szechuan dishes, try a Gewurztraminer. Gewurztraminer literally means "spice grapes" and the California variant, in particular, has a spicy peach flavor with a hint of ginger. Other possibilities include a French Pouilly Fuissé or a Sauvignon Blanc. Known as China's "haute cuisine," Cantonese dishes are much more subtly seasoned. For the best result, try a sweet fruity wine, such as a German Riesling. Meanwhile, a red Bordeaux is particularly appropriate for Shanghai cuisine. Dishes such as Lion's Head (large pork meatballs, topped with cabbage to suggest a lion's mane) are quite rich, and the tannin in the wine cuts the grease. A Merlot works well with Peking cuisine, which often features heavier meats like duck and beef. So does a burgundy such as Pinot Noir. Of course, there's nothing to say that you can't enjoy a cold brew or cocktail with your Chinese food. Beer is especially suited to spicier dishes, and, unlike wine, Chinese beer—especially Tsing Tao—is readily obtainable. Or you can stick with your own personal favorite. Kan Pei! ("Bottoms up").